Ian MacNairn came into the path of ultrarunning by accident. His initial steps as a trail-runner had announced the end of his recovery from near-fatal injury. Ian pursued rehabilitation through running as a health scientist, using his own case to study the physical, mental and social transformations that occur in pursuit of ultra-endurance. Ian continues studying ultrarunning as an anthropologist and student of medicine. He has published over 80 articles in national and international publications on running, sport, culture, and exploration. In 2013, Ian founded Kids Run Canada – an organization with over 35 events across Canada working to promote play and well-being by bringing youth outdoors through trail-running. Ian races across Canada and internationally. He has won or podium-ed in events from the 5K to 193K. 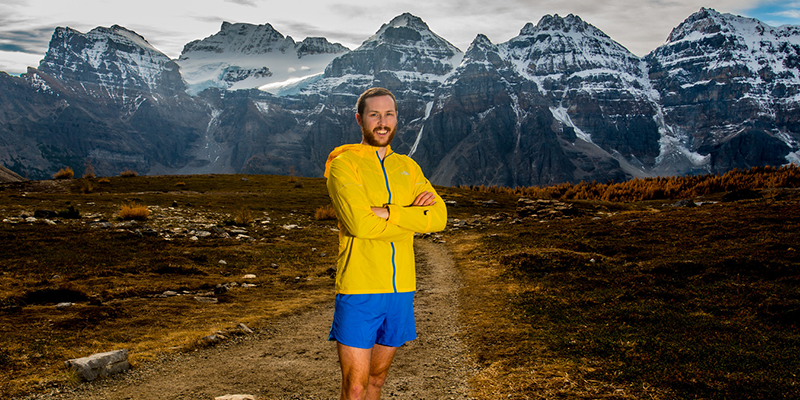 He has been the record holder for numerous ultramarathons and unsupported mountain routes in Canada. Ian is supported by The North Face, Smartwool, Julbo Eyewear, Clif Bar, Xact Nutrition, and Stoked Oats. Ian’s most passionate interests lie in exploring the limits of his body and mind. Ian is at home in the mountains, finding himself always drawn to the alpine and its jagged horizon. We are thrilled to hear from Ian at our show in April!! FEAT 2016 Tickets now on sale!! One Response to "Feat 2016 Speaker Announcement – Ian MacNairn"